Moderate drinking by parents can have a negative impact on children, causing anxiety and disrupting bedtime routines, a study says. 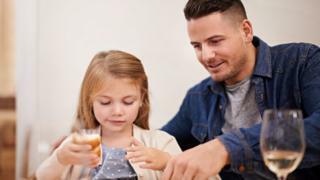 The Institute of Alcohol Studies said parents do not have to regularly drink large amounts around children for them to notice changes in adults' behaviour. Three in 10 parents said they have been drunk in front of their children and five in 10 "tipsy", its survey found. The institute said it was hoped the study will help inform parents. "All parents strive to do what's best for their children, so it's important to share this research about the effects drinking can have on parenting, and what steps parents can take to protect their children," the institute's chief executive Katherine Brown said. The report, "Like sugar for adults", uses a survey of almost 1,000 parents and their children, focus groups and experts. In the survey, as a result of their parents drinking, 18% of children said they had felt embarrassed, 11% had felt worried and 15% said their bedtime routine had been disrupted. Also, 7% said their parents had argued with them more than usual after drinking and 15% had asked their parents to drink less. The children surveyed who had seen their parent tipsy or drunk were also less likely to consider the way their parent drinks alcohol as providing a positive role model for them. The report was launched by MP Caroline Flint, who said: "We too quickly dismiss parental drinking as harmless fun and relaxation, but this report shows that parents do not need to be regularly drinking large amounts for their children to see a change in their behaviour and experience problems. "I'd like to see a more open conversation about this, among parents and professionals." Alison Douglas, chief executive of Alcohol Focus Scotland, called for "effective action to protect children and families from alcohol that is too cheap, readily available and constantly promoted."